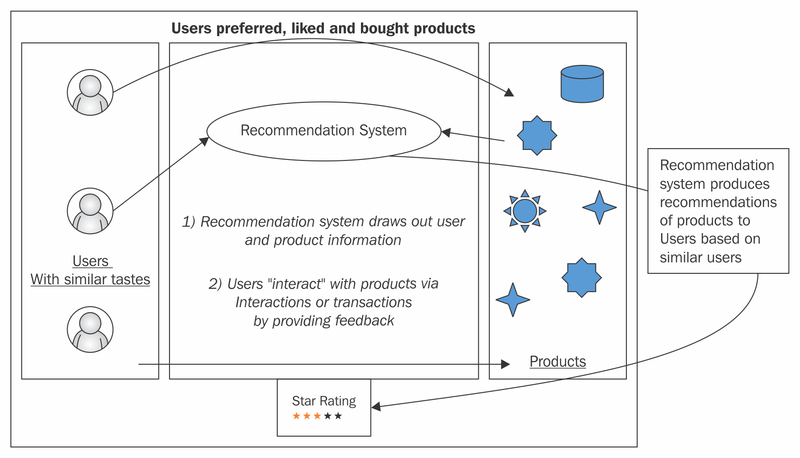 Recommendation systems can be defined as software applications that draw out and learn from data such as preferences, their actions (clicks, for example), browsing history, and generated recommendations, which are products that the system determines are appealing to the user in the immediate future. In this tutorial, we will learn to build a recommendation system with Scala and Apache Spark. 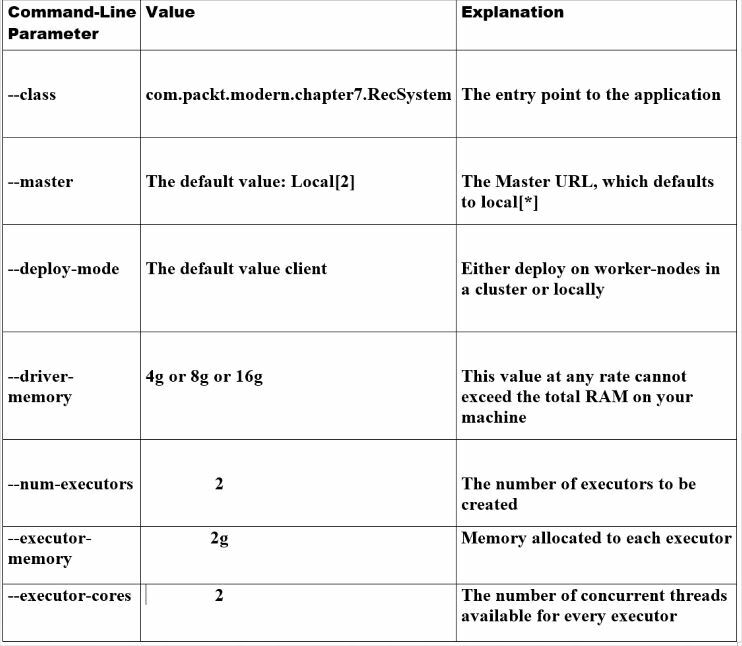 This article is an excerpt taken from Modern Scala Projects written Ilango Gurusamy. Implementation is documented in the following subsections. All code is developed in an Intellij code editor. The very first step is to create an empty Scala project called Chapter7. .idea: Generated IntelliJ configuration files. project: Contains build.properties and plugins.sbt. project/assembly.sbt: This file specifies the sbt-assembly plugin needed to build a fat JAR for deployment. src/main/scala: This is a folder that houses Scala source files in the com.packt.modern.chapter7 package. target: This is where artifacts of the compile process are stored. The generated assembly JAR file goes here. build.sbt: This is the main SBT configuration file. Spark and its dependencies are specified here. At this point, we will start developing code in the IntelliJ code editor. We will start with the AirlineWrapper Scala file and end with the deployment of the final application JAR into Spark with spark-submit. Next, let’s create a schema for past weapon sales orders. Next, let’s create a schema for weapon sales leads. 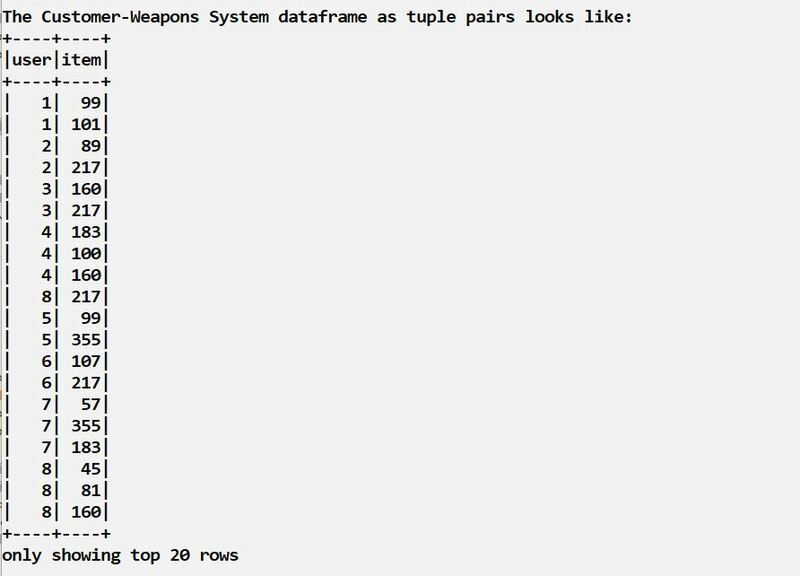 Next, let’s build a weapon sales order dataframe. 1) Create a lazy SparkSession instance and call it session. [error] C:\Path\To\Your\Project\Chapter7\src\main\scala\com\packt\modern\chapter7\RecSystem.scala:50:50: Unable to find encoder for type stored in a Dataset. Primitive types (Int, String, etc) and Product types (case classes) are supported by importing spark.implicits._ Support for serializing other types will be added in future releases. numBlocks: Preset to -1 in an auto-configuration setting. This parameter is meant to parallelize computation. custRank: The number of features, otherwise known as latent factors. iterations: This parameter represents the number of iterations for ALS to execute. For a reasonable solution to converge on, this algorithm needs roughly 20 iterations or less. alpha: This is a hyperparameter connected to an implicit feedback variant of the ALS algorithm. Its role is to govern the baseline confidence in preference observations. We just explained the role played by each parameter needed by the ALS algorithm’s train method. Now, let’s get down to training the matrix factorization model using the ALS algorithm. 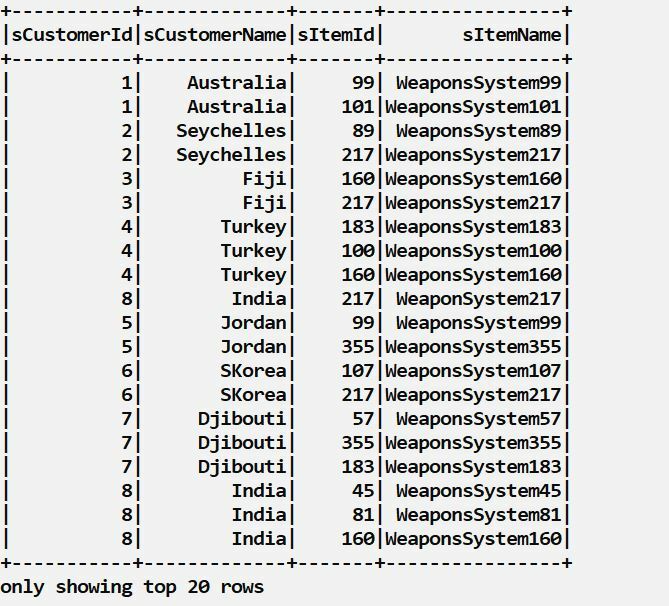 In the next section, we will display the new weapon sales lead dataframe. In the next section, let’s display the dataframe that we just created. 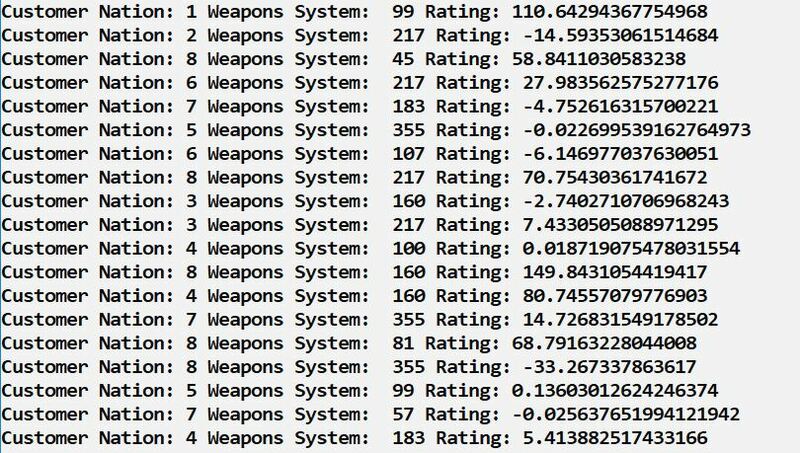 Notes: As far as the algorithm is concerned, customer corresponds to "user" and "product" or item corresponds to a "weapons system"
We previously created a MatrixFactorization model that we trained with the weapons system sales orders dataset. We are in a position to predict how each customer country may rate a weapon system in the future. In the next section, we will generate predictions. Next up, we will display the final predictions. Our recommendation system proved itself capable of generating future predictions. Up until now, we did not say how all of the preceding code is compiled and deployed. We will look at this in the next section. Besides loading build.sbt, the compile task is also loading settings from assembly.sbt which we will create below. 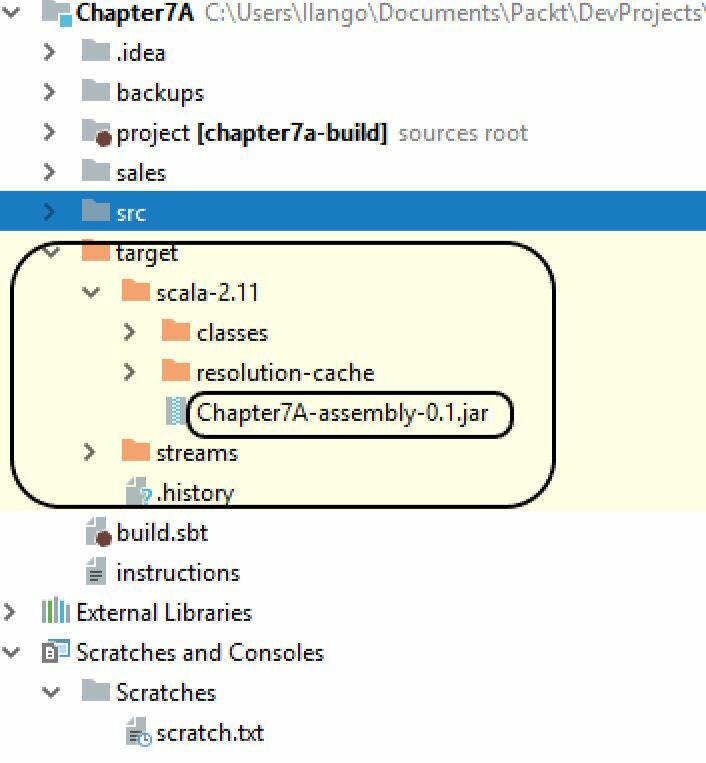 What is an assembly.sbt file? We have not yet talked about the assembly.sbt file. Our scala-based Spark application is a Spark job that will be submitted to a (local) Spark cluster as a JAR file. This file, apart from Spark libraries, also needs other dependencies in it for our recommendation system job to successfully complete. The name fat JAR is from all dependencies bundled in one JAR. To build such a fat JAR, we need an sbt-assembly plugin. This explains the need for creating a new assembly.sbt and the assembly plugin. The sbt-assembly plugin, version 0.14.7, gives us the ability to run an sbt-assembly task. With that, we are one step closer to building a fat or Uber JAR. This action is documented in the next step. This time, the assembly task loads the assembly-plugin in assembly.sbt. However, further assembly halts because of a common duplicate error. This error arises due to several duplicates, multiple copies of dependency files that need removal before the assembly task can successfully complete. To address this situation, build.sbt needs an upgrade. To test the effect of your changes, save this and go to the command line to reissue the sbt assembly task. Our JAR file under the target folder is the recommendation system application’s JAR file that needs to be deployed into Spark. This is documented in the next step. We used Spark’s support for recommendations to build a prediction model that generated recommendations and leveraged Spark’s alternating least squares algorithm to implement our collaborative filtering recommendation system. to gain insights into data that will help organizations have a strategic and competitive advantage.